Raspberry jam made with nothing but lipstick-red raspberries and sugar. Barebones as can be yet you’d never guess it from the taste. As the author of the much ballyhooed—and deservedly so—The Blue Chair Jam Cookbook explains, it takes a very large pan to make even a relatively small batch of preserves. Reason being, in order for the jam to have a spreadable consistency when cool, a large quantity of moisture must be cooked out of them. Yet in order for the fruit’s original flavor to remain intact, the preserves need to be over heat for as little time as possible. As a consequence, a wide pan is essential, as it allows a maximum of evaporation to occur in a minimum of time. If you decide to make a larger batch, bear in mind the moisture to be eliminated is directly proportional to the quantity of fruit used, so it would, in theory, need to be cooked for a much longer time. To ensure you do not compromise the quality of the preserves, you may want to make a couple small batches rather than a single large one. 1. Place a saucer and five metal teaspoons in a flat place in your freezer for testing the jam later. Have ready a medium-mesh strainer or chinois suspended over a heatproof bowl. 2. Combine the berries and sugar in an 11- or 12-quart copper preserving pan or a wide nonreactive pot. Place the pan over medium-low heat and cook, stirring and mashing constantly with a heatproof rubber spatula, until the juice begins to run from the berries. As soon as the sugar dissolves, increase the heat to high. Continue to cook, stirring very frequently, until the mixture boils. Boil the mixture vigorously for 10 to 15 minutes, stirring frequently. Best to begin testing for doneness after 10 minutes. 3. To test for doneness, remove the pan from the heat and carefully transfer a scant half teaspoonful of jam to one of your frozen spoons. Return the spoon to the freezer for 3 to 4 minutes, then remove and carefully feel the underside of the spoon. It should be neither warm nor cold; if still warm, return it to the freezer for a moment. Tilt the spoon vertically to see whether the jam runs; if the jam does not run, and if it has thickened to a near-jelly consistency, it is done. If the jam runs, return the pan to the stove and cook the mixture for another few minutes, stirring and testing again as many times as needed. 4. Using a stainless-steel spoon, skim any remaining foam from the surface of the preserve. If you don’t mind seeds in your jam, skip ahead to step 5. If you prefer seedless jam, quickly transfer the jam to the mesh strainer and force as much of the preserve as possible through it by pressing on it with the back of the spoon. Discard the seeds. Skim any foam that lingers on the surface of the strained jam. 5. Pour the jam into sterilized jars and process according to the manufacturer’s instructions. 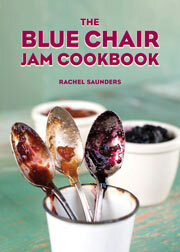 I love Rachel Saunders and The Blue Chair Jam Cookbook. Her approach is simple, straightforward, and, of course, delicious. If you’ve ever been afraid of making jam, this is the recipe for you! Berries and sugar, that’s it. No pectin or thickening agents. I even went a step further and canned my bounty using Rachel’s oven-canning method. Words of advice, do not overprocess the jam or you’ll have a serious mess on your hands! Otherwise this rich and jammy jam is simply perfect on toast, ice cream, between layers of luscious cake, or by the spoonful, especially in your jammies at midnight eating the jam straight from the jar. It really doesn’t get much better—or easier—than this. The color of the jam was beautiful, the texture excellent, the taste good, and the spreading factor good. My yield seemed to be about a third short, but when I weighed the seeds that I left out, I had the exact yield amount. This recipe delivers jam that isn’t too sweet and still tastes like fresh fruit! Even a first-time jammer will be successful thanks to the quick cooking time, few ingredients and easy instructions in this recipe. I halved the recipe and used my largest skillet. I started testing the jam at six minutes and pulled it off the heat at nine minutes. The only criticism I have is that I wished there had been a warning about the mixture bubbling up as it boiled. Raspberry Jam Recipe © 2010 Rachel Saunders. Photo © 2010 Sara Remington. All rights reserved. All recipes and photos used with permission of the publisher.